Library design: Creating an ecosystem. Like many spaces, the traditional library has undergone a dramatic shift, from a reading and storage site to a center of interactive learning. Today, libraries need to be multi-purpose, multi-dimensional, flexible, and technology focused spaces. In other words, they need to be places that can accommodate quiet seeking students and teams actively collaborating on digital projects. What’s the key to library design today and in the future? Much like the open plan office we believe it’s designing space as an ecosystem, creating an environment that seamlessly weaves together spaces for private and public. Most existing libraries were designed and built to find books or periodicals and check them out. Whether retrofitting or redesigning these libraries, the key is to understand that the new design should offer students a range of places and the control to select the most appropriate environment for their needs. Tips for Library design – create an ecosystem! Individual spaces should support focused work, be appropriately scaled for an individual and should be offered in both private and public settings. Public spaces should be designed to allow impromptu groups of people to openly come together in different postures. In addition, private teaming spaces should feature visual and acoustic shielding that supports active collaboration and the sharing of digital content. 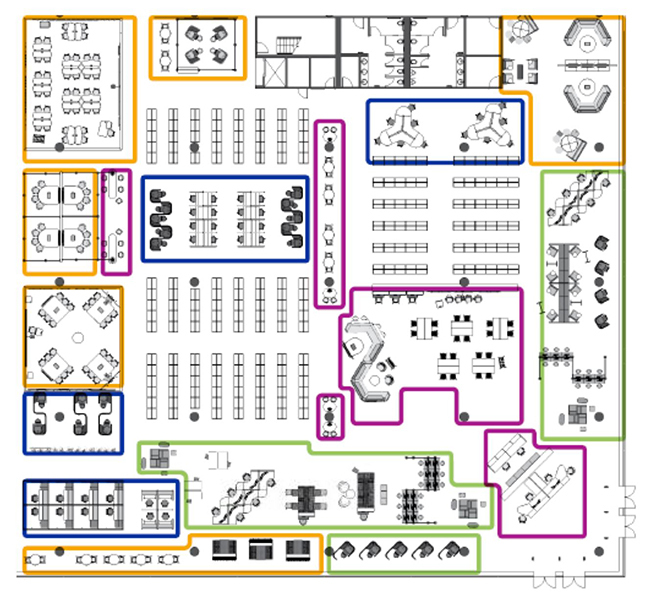 Here’s a floorplan that shows how these spaces can fit together in a unified ecosystem. These tips are from the Steelcase Active Learning Spaces; Insights, Applications and Solutions guide – a great resource packed with information on active learning. Individual spaces should support focused work but also the appropriate scale for an individual, their wellbeing and the security and accommodation of work tools. 1. Provide enclosed space for visual privacy. 2. Support the need for extreme focus and concentration by blocking all distractions. 3. Allow temporary ownership of space. 4. Support a range of short- and long-term ownership of space and privacy with assigned, secure spaces. Individuals want to work in the company of others to stay socially connected while working alone in various open settings. 1. Support the need for co-existence of focused work and social interactions; allow settings to switch from individual to dyads and triads. 2. Offer highly flexible and self-customizable furnishings and tools. 3. Support postural changes for short- and long-term use. 4. Enable quick, targeted access to computers, online services, printers, etc. 5. Support perched and standing short-term postures. 6. Provide access to dedicated computer workstations, specialized technologies and software. 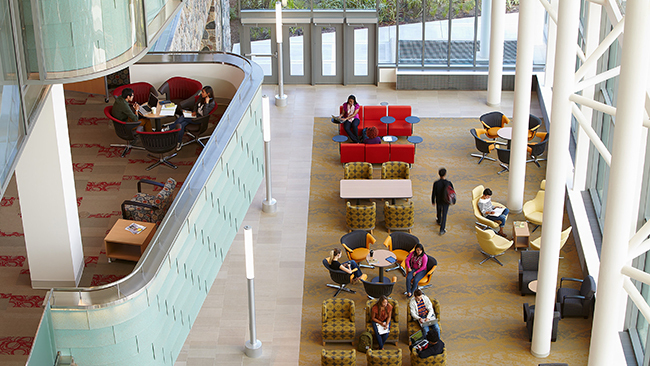 Library classrooms should accommodate active learning, computing and distance learning with fluid transitions. Team spaces should support multiple meeting modes and student project teams. 1. Support a fluid switch between activities. 2. Provide a range of blended learning and teaching environments, including online, webinars, etc. 3. Support multiple meeting modes – inform, evaluate and co-create – for small to large groups. 4. Provide tools for visual display, collaborative technology, information and acoustical privacy. 5. Provide highly flexible, customizable furniture to meet collaborative, privacy and ergonomic needs. Students often do group work in open areas to stay connected to others, requiring flexibility to meet their changing needs. Reference areas should capitalize on librarians’ expertise in mentoring and teaching. The increased use of technology requires just-in-time technical support. The increased use for events requires multi-purpose, adaptable gathering places. 1. Accommodate impromptu teaching and collaborative activities. 2. Remove barriers between students and staff. 3. Provide accessible dedicated spaces for technical services. 4. Create multi-purpose, adaptable spaces to host large functions. By rethinking the library using an ecosystem of interrelated spaces, we turn a static environment into a dynamic and flexible space that can accommodate different needs and become an active hub for all. Top tips for selecting the best task chair.